Astro Legends: Lyra and Erion by Foxium is one of the best electronic music-themed casino online slots. Instead of jamming at a house concert, club or party, here you get to jam out on a distant planet with Lyra and Erion. The oddness of the theme is matched by its intriguing gameplay. Foxium is a newcomer in the online slots world given that the company is currently less than 5 years old. It was formed in 2015 and is headquartered in Tallinn, capital of Estonia. The country isn’t a gambling hub and probably one of those places you wouldn’t expect to find an e-gaming community. However, this unheard of brand is already proving that it didn't come to play with it’s two already popular slot releases Stereo Miami & Big Time Journey. Astro Legends plays out on a far and distant planet with free spins bonus. Everything on here looks incredibly beautiful. The backdrop includes an abandoned cityscape, a huge planet lies in the distance floating in the air among some thick clouds. The reel setup is quite unique, not your usual row setting. Your goal should be to hit at least 5 connected matching symbols to win rewards. Lyra stands beside the reels, strumming her instrument on the left side of the reels. There are 6 standard symbols on the reels; a peridot, an amethyst, a garnet and card symbols A, Q and K struck into rock. 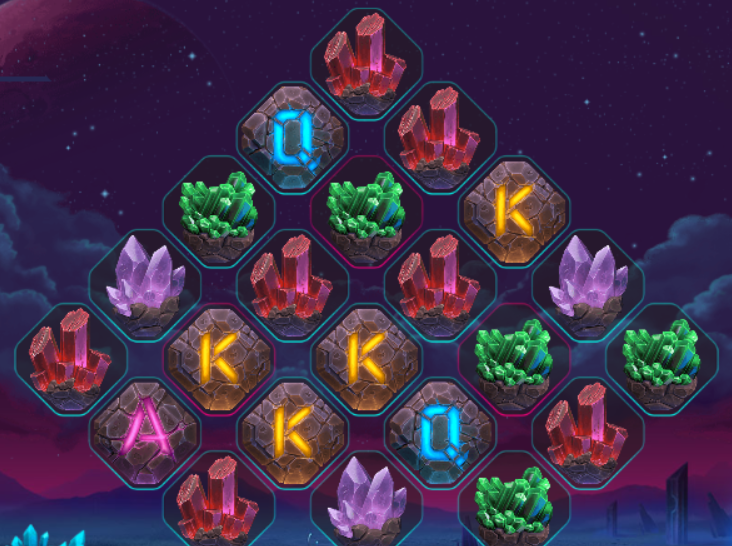 Wild symbol -The wild can only hit along the 3 pink-edged positions on the reels and whenever it forms part of a winning combination, a multiplier of up to 5x will apply. Sonic Respin -This feature can occur at random after a win during the main game and all symbols involved become locked in place. Erion finally emerges from the hole he's been hiding in and blocks all the other reel positions. Lyra then blasts them all away. If there were any matching symbol combinations, another respin will be awarded. The bonus round ends when no more matching symbol combinations can be formed. Stardust Collection/Lyra Spirit Bonus -Every now and then, a star-shaped bubble floats onto the reels ready to be popped by Lyra. When she successfully pops it, you are awarded (between 2 and 10) with your total being indicated in the top left-hand corner. When you put together a total of 100, the Lyra Spirit Bonus begins and Lyra transforms into a wolf. Spinners must choose 1 of 3 tracks for Lyra to run across, avoiding rocks purposefully placed by Erion on the way. You get to also pick up gems along the trail which increase the multiplier value for your wins. Make it through 7 levels or lose all 3 lives and the round ends with any remaining lives adding a 20x multiplier to the total reward. Astro Legends looks incredible and comes with its own interplanetary soundtrack to match. The feature doesn’t take long to collect the Stardust to activate the main feature. That’s where the biggest wins are more likely to come from. This slot has an RTP value of 96.63%. So, play today here at Easy.